Harboe Arena Slagelse is the name of the sports complex stadium located in the Slagelse municipality within the island of Zealand. 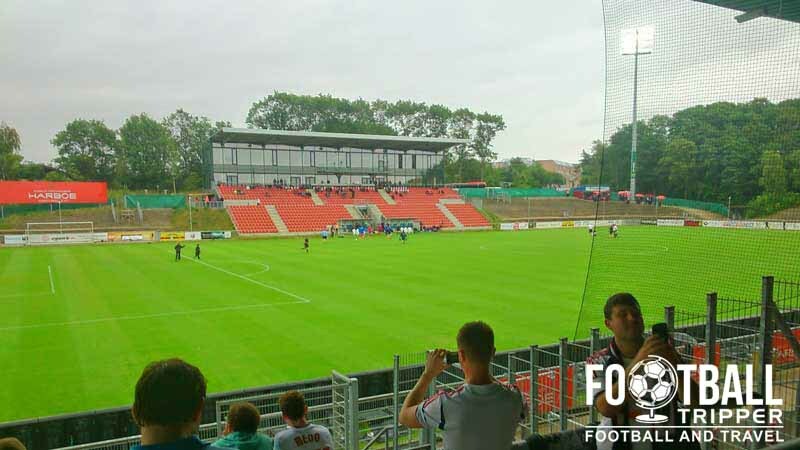 Used primarily for football matches of local team FC Vestsjælland the 10,000 capacity ground has approximately 3,300 seats and underwent a partial rebuild in 2012 with under-soil heating and new floodlights added. Harboe Arena Slagelse is the general name used to refer to the football stadium within the sports complex, although technically it could refer to other facilities such as the athletics track. The sports centre facilities were constructed by the Slagelse Municipality back in 1927 in order to serve the local area after the merger of two local sports teams: Slagelse FC and Slagelse Sports Association. Undergoing a handful of renovations throughout the 20th century, today Harboe Arena Slagelse has a capacity of 10,000 although only around one third of this is allocated as seating, with the stadium boasting just 3,300 seats.With the club playing the majority of the their football in either the second or third divisions, there hasn’t been much need to expand the ground since the 1970s. 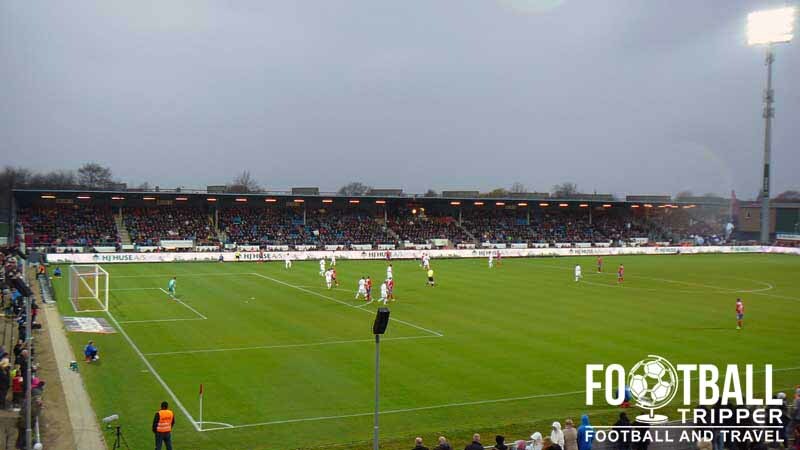 Slagelse Stadium’s record attendance was set early on in this decade when the home side took on Holbæk B & I, and since then sell-outs at the ground have been few and far between. The most recent renovations took place during the 2012-2013 season when the club decided to upgrade the basic facilities, with the installation of new lights and under-soil heating two of the most notable improvements made. 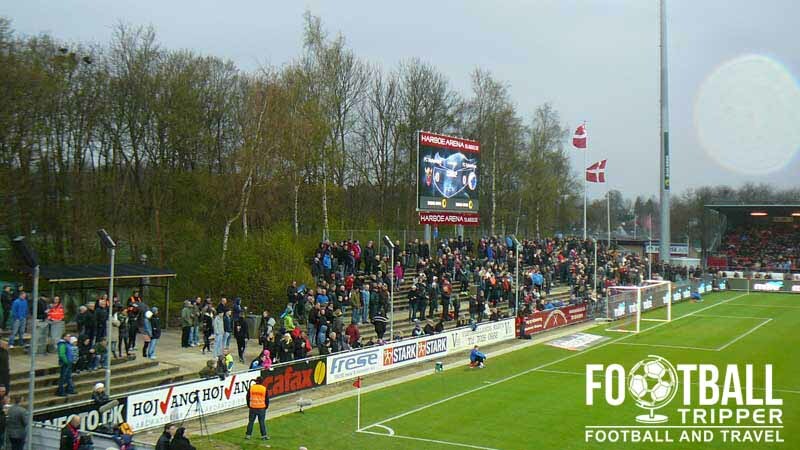 At the start of the 2013 season it was announced that Slagelse had sold the naming rights to the Harboe Brewery who are also from the local Zealand Region, and thus Stadion Slagelse became known as Harboe Arena Slagelse. The Brewery have always been long-term sponsors of the club, and thus many viewed the sponsorship of the stadium name as the next natural step in the relationship. The Harboe Arena is comprised of four stands: North, East, South and West. Away fans are housed within Block 7 of the western stand as shown on the above seating plan which calls the away section “udebaneafsnit”. The visiting supporters are separated from the home fans via a section of metal fencing. A Pretty cool bar outside the stadium which opens on matchdays. Whilst there isn’t a permanent club shop at Harboe Arena or indeed an online store you can purchase official merchandise from the stalls outside the stadium on matchdays. One of the many merchandising kiosks dotted around Harboe Arena Slagelse on matchdays. This one also sells pop corn! 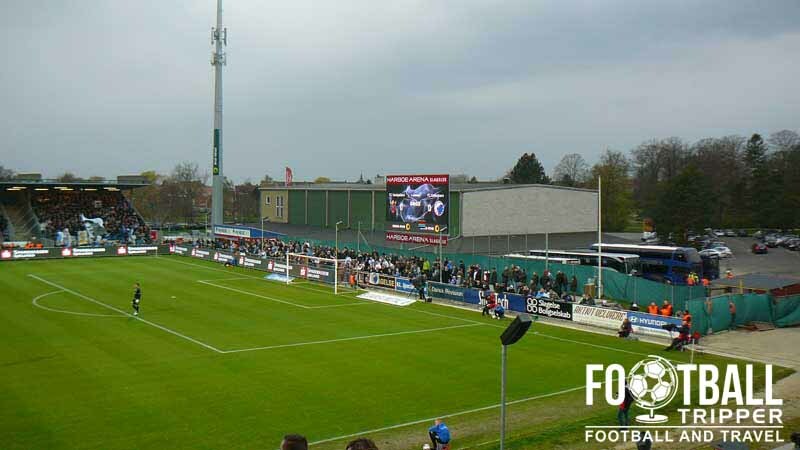 It doesn’t seem as if there are any tours available of FC Vestjaelland’s stadium at this moment in time. 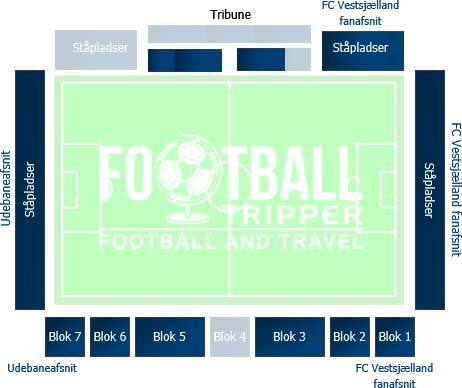 Tickets to see FC Vestjaelland play at home can either be purchased online in advance of the match or from the various ticket points around the ground on which open one hour before kick-off on matchdays. Pensioners & Children: 65 Kr. Please note that slight savings of between 5-10 Kr. can be made by purchasing tickets online rather than before kick-off due to decreased staffing costs. Harboe Arena is located approximately 750 metres south-east of Slagelse city centre, and only 1.5 km from the main railway station. Subsequently the walk from anywhere in Slagelse is likely to take the average Football Tripper no more than 15 minutes MAXIMUM. More like 10 minutes though. There are two small car parks at Slagelse stadium however the exact matchday parking arrangements are unclear. The eastern car park may operate on a first-come first-served basis but this is just a hunch. Slagelse station has a number of Inter Regional services to Copenhagen, and other major Danish city’s. The main platform of Slagelse Railway Station as seen on a relatively bright day. Parkvej road which runs west of the stadium has a bus stop known as Parkvænget (Slagelse) which is served by bus numbers 901 and 902. The closest International airport is undoubtedly Copenhagen Kastrup Airport which is 98 km east of Slagelse. Second to this is Malmo Airport 151 km away in Sweden. The small town of Slagelse doesn’t really have many places to stay with Hotel Regina being the pick of a very limited bunch. South of the ground just off of the E20 there is the Hotel Frederik and Hotel Antvorskov however you would need either a taxi or a rental car to get there.